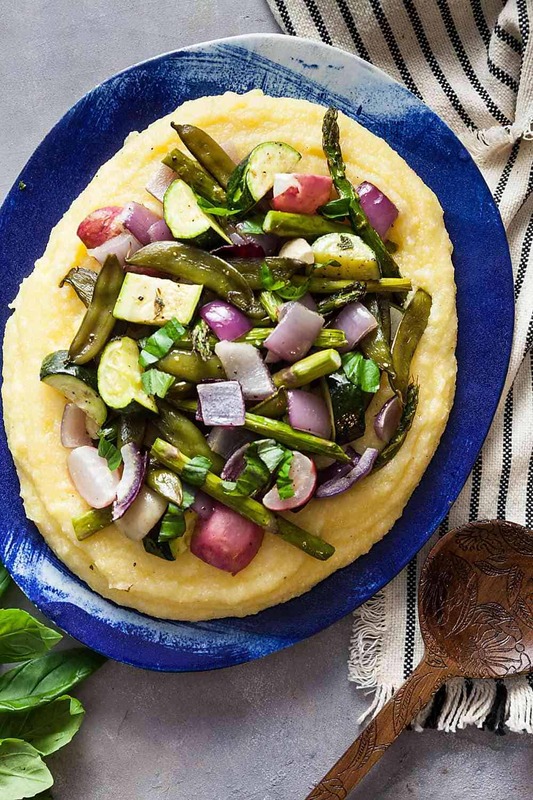 Cheesy Polenta with Roast Spring Vegetables | Healthy. Delicious. 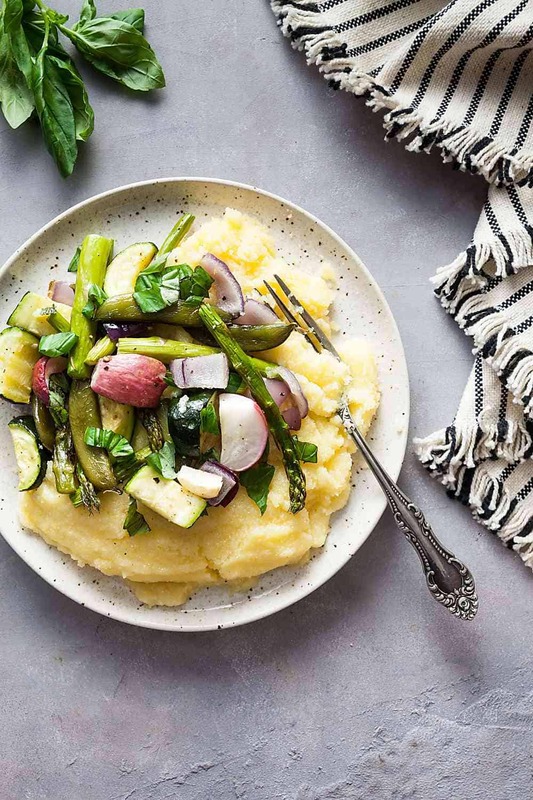 A bed of creamy, cheesy polenta topped with roasted spring vegetables is a delicious way to welcome the change of seasons. I created this recipe for my client, GO VEGGIE. Thank you for supporting the brands that keep me inspired in the kitchen. As much as I hate daylight saving time – it’s been over a week and I still feel jetlagged – I love the longer days that come along with it. I was so excited that I didn’t have to turn my headlights on when I drove home from work the other night! It finally feels like spring is almost here. My cravings have definitely shifted, too. I’m suddenly in the mood for meals that are a little lighter – and a lot greener. My diet has been sorely lacking vegetables lately. 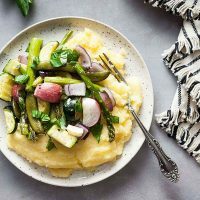 This cheesy polenta topped with roasted spring vegetables is exactly the kind of meal I like eating this time of year. The polenta is warm, creamy, and super cozy – and lactose-free, thanks to GO VEGGIE cheese. The vegetables are fresh and seem new and exciting after weeks of eating hearty winter vegetables. What vegetables do I use? I basically walk through the produce aisle and grab whatever looks good. Asparagus is a must. I also grabbed some radishes, since I love how those roast, and some snow peas. Plus some red onion and zucchini for good measure. 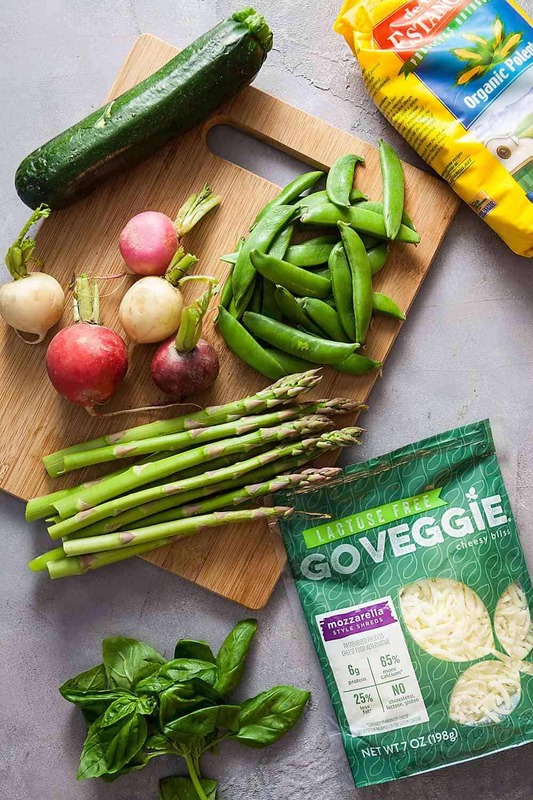 This recipe is so easy to make – you’ll roast the vegetables together all on one plan while the polenta cooks on the stovetop. It’s also great leftover, so it works well for meal prep. Eat it as the recipe is written, or experiment with different sauces and seasonings. I love adding a drizzle of balsamic vinegar, pistachio pesto, or a generous sprinkle of GO VEGGIE parmesan cheese to give my leftovers new life. Polenta might look fancy, but it’s one of the easiest side dishes to make. I like polenta to be super creamy, so I always use more liquid than the package calls for, especially since I also add a ton of GO VEGGIE mozzarella cheese. I like to use a ratio of about 6 cups of liquid to every cup of cornmeal. I also stir in a big pat of nondairy butter or a good glug of olive oil at the end to help prevent it from setting up too quickly. To make the polenta, start by bringing 4 cups of vegetable broth (there’s a GREAT recipe for homemade garden vegetable broth in my book) and 2 cups of water to a boil. Turn down the heat and slowly whisk in 1 cup of instant polenta a little bit at a time. Cook for 1 minute until the polenta is creamy and smooth. Now, stir in 2 cups of GO VEGGIE lactose-free mozzarella shreds and 1 tablespoon of dairy-free butter or olive oil. If the polenta seems too stiff, you can stir in another cup of water or broth. Finally, season the polenta with salt and pepper and serve immediately. GO VEGGIE’s mozzarella melts just like traditional cheese, but it’s great for people with lactose intolerances. It also has 25% less fat and 65% more calcium compared to ordinary cheese. I usually buy the lactose-free variety since it’s the easiest to find, but they also have a vegan version that’s perfect for vegans or people with a full dairy allergy (the lactose-free variety does contain casein). Use the handy store locator on their site to find the product you’re looking for at a store near you. I use it all. the. time. Toss the asparagus, radishes, zucchini, snow peas, and onion with 1 tablespoon olive oil. Season generously with salt and pepper. Spread onto a sheet pan and roast until tender and beginning to char in places, about 30 minutes. Meanwhile, combine the vegetable broth and water in a medium saucepan. Bring to a boil over medium-high heat, then reduce the heat to low. Slowly whisk in the polenta and cook for 1 minute, until smooth and creamy. Stir in the mozzarella and butter. If the polenta is too thick, stir in a little more broth or water to loosen. Season to taste with salt and pepper. Spoon the polenta in a serving dish; top with roast vegetables and fresh basil. Serve immediately.